Harold Heins, 101 of Garrison, died Saturday, November 19, 2016, at david place in David City. Kracl Funeral Chapel David City, in charge of arrangements. Harold H. Heins was born August 5, 1915 on a farm near Garrison, to Jacob and Emma(Dallegge) Heins. He attended school through the 11th grade at Garrison and graduated from David City high school in 1932. In February of 1943 Harold enlisted in the United States Army. 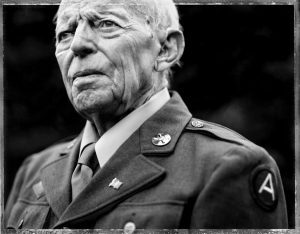 He served during WWII in the European Theatre in Unit 546, company C of the third Army. On December 10, 1940, he was united in marriage to Ruby From at the parsonage of St. John’s Lutheran Church in Surprise, Nebraska. Harold farmed in the Garrison area and lived his entired life there. 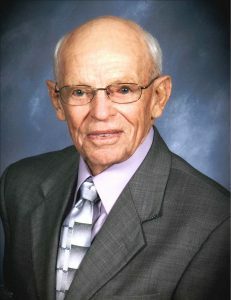 Harold was a former Sunday school teacher, served on the church council, school board, soil conservation board, coop elevator and on the governor’s advisory board. Survived by Children: Larry (Jeanette) Heins of David City, Beverly (Richard) Bennett of David City, Patricia (Albert) Richert, Waco, NE, Dean (Connie) Heins of David City. 11 grandchildren, 6 step grandchildren, 39 great grandchildren. Preceded in death by wife Ruby (Jan. 29, 1994), sister Mildred Anderson.